It has been suggested that Mackinac Island, Michigan be merged into this article. (Discuss) Proposed since January 2019. This article is about the island in Michigan. For the city of the same name, see Mackinac Island, Michigan. For the state park, see Mackinac Island State Park. For history of the general area, see Michilimackinac. Mackinac Island (/ˈmækɪnɔː/ MAK-in-aw) is an island and resort area, covering 3.8 square miles (9.8 km2) in land area, in the U.S. state of Michigan. It is located in Lake Huron, at the eastern end of the Straits of Mackinac, between the state's Upper and Lower Peninsulas. The island was home to an Odawa settlement before European exploration began in the 17th century. It served a strategic position as a center on the commerce of the Great Lakes fur trade. This led to the establishment of Fort Mackinac on the island by the British during the American Revolutionary War. It was the site of two battles during the War of 1812. In the late 19th century, Mackinac Island became a popular tourist attraction and summer colony. Much of the island has undergone extensive historical preservation and restoration; as a result, the entire island is listed as a National Historic Landmark. It is well known for its numerous cultural events; its wide variety of architectural styles, including the Victorian Grand Hotel and its ban on almost all motor vehicles. More than 80 percent of the island is preserved as Mackinac Island State Park. Like many historic places in the Great Lakes region, Mackinac Island's name derives from a Native American language. Native Americans in the Straits of Mackinac region likened the shape of the island to that of a turtle so they named it "Mitchimakinak" (Ojibwe: mishimikinaak) "Big Turtle". Andrew Blackbird, an official interpreter for the U.S. government and an Odawa chief's son, said it was named after a tribe that had lived there. The French spelled it with their version of the original pronunciation: Michilimackinac. The British shortened it to the present name: "Mackinac." Michillimackinac is also spelled as Mishinimakinago, Mǐshǐma‛kǐnung, Mi-shi-ne-macki naw-go, Missilimakinak, Teiodondoraghie. Mishinimakinago; pl.-g.—This name is given to some strange Indians (according to the sayings of the Otchipwes [Ojibwe]), who are rowing through the woods, and who are sometimes heard shooting, but never seen. And from this word, the name of the village of Mackinac, or Michillimackinac, is derived. Maehkaenah is the Menominee word for turtle. In his 1952 book The Indian Tribes of North America, John Reed Swanton recorded under the "Wisconsin" section: "Menominee," a band named "Misi'nimäk Kimiko Wini'niwuk, 'Michilimackinac People,' near the old fort at Mackinac, Mich."
In an early written history of Mackinac Island (1887) by Andrew Blackbird, the Odawa historian, he describes that a small independent tribe called "Mi-shi-ne-macki naw-go" once occupied Mackinac Island. They became confederated with the Ottawa from Ottawa Island (now Manitoulin Island) situated north of Lake Huron. One winter the Mi-shi-ne-macki naw-go on Mackinac Island were almost entirely annihilated by the Seneca people from New York, who were part of the Iroquois Confederacy. Only two of the local natives escaped by hiding in one of the natural caves at the island. To commemorate the losses of this allied tribe, the Ottawa named what is now Mackinac Island, as "Mi-shi-ne-macki-nong." In 1895 Fort Mackinac's John R. Bailey, M. D. published his history, entitled Mackinac formerly Michilimackinac, describing some of the first recorded presence on Mackinac of French traders. They arrived in 1654 with a large party of Huron and Ottawa heading to Three Rivers; another visitor was an adventurer making a canoe voyage in 1665. Archaeologists have excavated prehistoric fishing camps on Mackinac Island and in the surrounding areas. Fishhooks, pottery, and other artifacts establish a Native American presence at least 700 years before European exploration, around AD 900. The island is a sacred place in the tradition of some of its earliest known inhabitants, the Anishinaabe, who consider it to be home to the Gitche Manitou, or the "Great Spirit". According to legend, Mackinac Island was created by the Great Hare, Michabou and was the first land to appear after the recession of the Great Flood. The island was a gathering place for the local tribes where their offerings were made to Gitche Manitou, and it was the burial place of tribal chiefs. The first European likely to have seen Mackinac Island is Jean Nicolet, a French-Canadian coureur des bois, during his 1634 explorations. The Jesuit priest Claude Dablon founded a mission for the Native Americans on Mackinac Island in 1670, and stayed over the winter of 1670–71. Dablon's fall 1671 successor, the missionary and explorer Jacques Marquette, moved the mission to St. Ignace soon after his arrival. With the mission as a focus, the Straits of Mackinac quickly became an important French fur trading location. The British took control of the Straits of Mackinac after the French and Indian War and Major Patrick Sinclair chose the bluffs of the island for Fort Mackinac in 1780.
its fisheries, its phenomena of wind and tide, and the tribes who, now and in the past, have made it their abode. A favorite resort for all the Algonkin tribes, many are returning to it since the peace with the Iroquois. On this account, the Jesuits have begun a new mission, opposite Mackinac, called St. Ignace. Thither have fled the Hurons, driven from Chequamegon Bay by fear of the Sioux, "the Iroquois of the West." The Relations also indicate the tremendous strategic importance of Michilimackinac/Mackinac Island as "the central point for all travel on the upper Great Lakes, and for a vast extent of wilderness and half-settled country beyond" to First Nations and Europeans (prior to the arrival of railroads). The tribes who had inhabited Mackinac Island had been driven away by the Iroquois, leaving the island practically deserted until 1670. The Huron people from Lake Superior, in fear of the Sioux, retreated to the shore north of Mackinac Island. Here Marquette continued his missionary labors with them, at the site of the present St. Ignace. The 1688 memoir of Jacques-René de Brisay de Denonville, Marquis de Denonville, claimed that the French had inhabited the area since 1648. A small French garrison was sent there some time between 1679 and 1683. 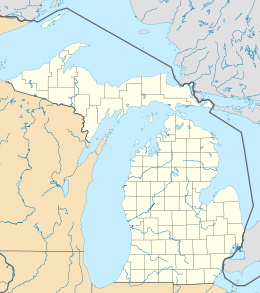 The name of Michilimackinac (later abbreviated to Mackinac) was applied generally to the entire vicinity, as well as specifically to the post at St. Ignace. Later it was applied to the fort and mission established on the south side of the Strait of Mackinac. Although the British built Fort Mackinac to protect their settlement from attack by French-Canadians and native tribes, the fort was never attacked during the American Revolutionary War. The entire Straits area was officially acquired by the United States through the Treaty of Paris (1783). However, much of the British forces did not leave the Great Lakes area until after 1794, when the Jay Treaty established U.S. sovereignty over the Northwest Territory. During the War of 1812, the British captured the fort in the Siege of Fort Mackinac, the first battle of the conflict, because the Americans had not yet heard that war had been declared. 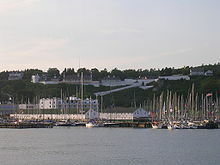 The victorious British attempted to protect their prize by building Fort George on the high ground behind Fort Mackinac. In 1814, the Americans and British fought a second battle on the north side of the island. The American second-in-command, Major Andrew Holmes, was killed and the Americans failed to recapture the island. Despite this outcome, the Treaty of Ghent of 1815 forced the British to return the island and surrounding mainland to the U.S. The United States reoccupied Fort Mackinac, and renamed Fort George as Fort Holmes, after Major Holmes. Fort Mackinac remained under the control of the United States government until 1895 and provided volunteers to defend the Union during the American Civil War. The fort was used as a prison for three Confederate States of America sympathizers. John Jacob Astor's American Fur Company was centered on Mackinac Island after the War of 1812 and exported beaver pelts for thirty years. By the middle of the nineteenth century, commercial fishing for common whitefish and lake trout began to replace the fur trade as the island's primary industry. As sport fishing became more popular in the 1880s, hotels and restaurants accommodated tourists coming by train or lake boat from Detroit. Following the Civil War, the island became a popular tourist destination for residents of cities on the Great Lakes. Much of the federal land on Mackinac Island was designated as the second national park, Mackinac National Park, in 1875, just three years after Yellowstone National Park was named as the first national park. To accommodate an influx of tourists in the 1880s, the boat and railroad companies built hotels, including the Grand Hotel. Souvenir shops began to spring up as a way for island residents to profit from the tourists. Many wealthy business magnates built summer "cottages" along the island's bluffs for extended stays. When the federal government left the island in 1895, all of the federal land, including Fort Mackinac, was given to the state of Michigan and became Michigan's first state park. The Mackinac Island State Park Commission appointed to oversee the island has limited private development in the park and requires leaseholders to maintain the island's distinctive Victorian architecture. Motor vehicles were restricted at the end of the nineteenth century because of concerns for the health and safety of the island's residents and horses after local carriage drivers complained that automobiles startled their horses. This ban continues to the present with exceptions only for emergency and construction vehicles. Mackinac Island is about 8 miles (13 km) in circumference and 3.8 square miles (9.8 km2) in total area. The highest point of the island is the historic Fort Holmes (originally called Fort George by the British before 1815), which is 320 feet (98 m) above lake level and 890 feet (271 m) above sea level. According to the 2010 United States Census, the island has a year-round population of 492. The population grows considerably during the summer as hotels, restaurants, bars and retail shops, open only during the summer season, hire short-term employees to accommodate as many as 15,000 visitors per day. Mackinac Island was formed as the glaciers of the last ice age began to melt around 13,000 BC. The bedrock strata that underlie the island are much older, dating to Late Silurian and Early Devonian time, about 400 to 420 million years ago. Subsurface deposits of halite (rock salt) dissolved, allowing the collapse of overlying limestones; these once-broken but now solidified rocks comprise the Mackinac Breccia. The melting glaciers formed the Great Lakes, and the receding lakewaters eroded the limestone bedrock, forming the island's steep cliffs and rock formations. At least three previous lake levels are known, two of them higher than the present shore: Algonquin level lakeshores date to about 13,000 years ago, and the Nipissing level shorelines formed 4,000 to 6,000 years ago. During an intermediate period of low water between these two high-water stages, the Straits of Mackinac shrank to a narrow gorge which discharged its water over Mackinac Falls, located just east of the island (beyond Arch Rock), into Lake Huron. As the Great Lakes assumed their present levels, the waterfall was inundated and Mackinac Island took on its current size. The steep cliffs were one of the primary reasons for the British army's choice of the island for a fortification; their decision differed from that of the French army, which had built Fort Michilimackinac about 1715 near present-day Mackinaw City. The limestone formations are still part of the island's appeal. One of the most popular geologic formations is Arch Rock, a natural limestone arch, 146 feet (45 m) above the ground. Other popular geologic formations include Devil's Kitchen, Skull Cave, and Sugar Loaf. Mackinac Island contains a wide variety of terrain, including fields, marshes, bogs, coastline, boreal forest, and limestone formations. The environment is legally preserved on the island by the State Historic Park designation. About half of the shoreline and adjacent waters off Mackinac Island, including the harbor (Haldimand Bay) and the southern and western shore from Mission Point to Pointe aux Pins, is protected as part of the Straits of Mackinac Shipwreck Preserve, a state marine park. As it is separated from the mainland by 3 miles (4.8 km) of water, few large mammals inhabit the island, except those that traverse the ice during the winter months. Rabbits, fox, raccoons, otters, mink, gray and red squirrels, and chipmunks are all common as is the occasional beaver and coyote. Bats are the most abundant migratory mammals as crossing the water is no obstacle for them. There are many limestone caves serving as homes for the bats and many insects on the island for the bat to prey on. The island is frequented by migratory birds on their trips between their summer and winter habitats. Eagles and hawks are abundant in April and May, while smaller birds such as yellow warblers, American redstart, and indigo bunting are more common in early summer. Near the shoreline, gulls, herons, geese, and loons are common. Owls, including snowy owls and great grey owls, come to the island from the Arctic to hunt in the warmer climate. Other birds, such as chickadees, cardinals, blue jays, and woodpeckers, live on the island year-round. Toads have also been found. Mackinac Island contains over 600 species of vascular plants. Flowering plants and wildflowers are abundant, including trillium, lady slippers, forget-me-nots, violets, trout lily, spring beauty, hepatica, buttercups, and hawkweeds in the forests and orchids, fringed gentian, butter-and-eggs, and jack-in-the-pulpit along the shoreline. The island's forests are home to many varieties of trees, such as maple, birch, elm, cedar, pine, and spruce. The island's newspaper is the Mackinac Island Town Crier. It has been owned and operated by Wesley H. Maurer Sr. and his family since 1957 as training for journalism. It is published weekly from May through September and monthly during the rest of the year. Mackinac Island's main street, looking west. Transportation on the island is by horse, bike, or foot. The island can be reached by private boat, by ferry, by small aircraft, and in the winter, by snowmobile over an ice bridge. The airport has a 3,500-foot (1,070 m) paved runway, and daily charter air service from the mainland is available. In the summer tourist season, ferry service is available from Shepler's Ferry, and Star Line Ferry to shuttle visitors to the island from St. Ignace and Mackinaw City. Motorized vehicles have been prohibited on the island since 1898, with the exception of snowmobiles during winter, emergency vehicles, and service vehicles. Travel on the island is either by foot, bicycle, or horse-drawn carriage. Roller skates and roller blades are also allowed, except in the downtown area. Bicycles, roller skates/roller blades, carriages, and saddle horses are available for rent. An 8-mile (13 km) road follows the island's perimeter, and numerous roads, trails and paths cover the interior. M-185, the United States' only state highway without motorized vehicles, makes a circular loop around the island, closely hugging the shoreline. The island is the location of Mackinac Island State Park, which covers approximately 80 percent of the island and includes Fort Mackinac as well as portions of the island's historic downtown and harbor. No camping is allowed on the island, but numerous hotels and bed and breakfasts are available. The downtown streets are lined with many retail stores and restaurants. Most of the buildings on Mackinac Island are built of wood, a few are of stone, and most have clapboard siding. The architectural styles on the island span 300 years, from the earliest Native American structures to the styles of the 19th century. The earliest structures were built by the Anishinaabe and Ojibwe (Chippewa) tribes before European exploration. At least two buildings still exist from the original French settlement in the late 18th century. Mackinac Island has the only example of northern French rustic architecture in the United States, and one of few survivors in North America. Mackinac Island also contains examples of Federalist, Colonial, and Greek Revival styles. Much of the island is built in the later style of the Victorian era which includes Gothic Revival, Stick style, Italianate, Second Empire, Richardson Romanesque and Queen Anne styles. The most recent styles used on the island date from the late 19th century to the 1930s and include the Colonial and Tudor revival styles. All of Mackinac Island was listed as a National Historic Landmark in October 1960. In addition, because of the island's long history and preservation efforts starting in the 1890s, eight separate locations on the island, and a ninth site on adjacent Round Island, are listed in the United States National Register of Historic Places. The entire island, Haldimand Bay, and a small shipwreck form a historic district. Fort Mackinac was built in 1780 and was closed as a fort in 1895 as it no longer had any strategic purpose. It has been restored to its late 19th century state through efforts beginning in the 1930s. The Biddle House, one of the oldest structures on Mackinac Island, was built about 1780 and is interpreted in its role as a prosperous family home during the height of the fur trade in the 1820s. The McGulpin House, a working-class home possibly constructed prior to 1780, is interpreted as a frontier working-class home. The Agency House of the American Fur Company was built in 1820 as the home for the company's Mackinac Island agent, Robert Stuart. It is now open to the public as a fur trade museum. The Mission House was built on Mission Point in 1825 by Presbyterian missionary William Montague Ferry as a boarding school for Native American children. It became a hotel in 1849 and a rooming house in 1939. It is restored and now houses State Park employees. The 108 ft. tall glassed-in Mission Point historical museum has five floors of historical exhibits and views of the Mackinac Straits. Exhibits include the maritime history of Mackinac Island, Great Lakes lighthouses, shipping, and shipwrecks, Mackinac Bridge construction, and the film Somewhere in Time, which was primarily filmed on Mission Point property. The Mission Church was built in 1829 and is the oldest surviving church building in Michigan. Restoration efforts have returned the church to its 1830s appearance. The Indian Dormitory was constructed under direction of U.S. Indian agent Henry Rowe Schoolcraft after the signing of the 1836 Treaty of Washington, as a school and a place for Native Americans visiting the island to stay when receiving yearly allotments. The building was restored in 1966 and converted to a museum, which was closed in 2003. On July 2, 2010, the building reopened as The Richard and Jane Manoogian Mackinac Art Museum. It showcases Mackinac art from prehistory to the present, and includes a kids' art studio. The Matthew Geary House was built in 1846, was added to the register in 1971, and is now available for vacation rentals. The current Sainte Anne Church was built from 1874. It replaced earlier parish churches in use on Mackinac Island and the adjacent mainland; the parish register lists sacraments from 1695. The Grand Hotel is a Victorian-style structure that opened in 1887. The 1980 film Somewhere in Time was shot on location at the hotel. The Round Island Lighthouse is located just south of the island on the small, uninhabited Round Island. The light was built in 1894 and automated in 1924. Extensive restoration efforts began in the 1970s and the exterior and structure have since been repaired. Wawashkamo Golf Club was laid out in 1898 as a Scottish links-type course and is now the oldest continuously played golf course in Michigan. The Michigan Governor's Summer Residence was built overlooking the harbor in 1902 and was purchased by the state for use as a governor's residence in 1943. Anne's Tablet is an Art Nouveau sculptural installation added to a blufftop overlook in 1916. There are several children's parks on the island. The most popular ones include the playground on the schoolyard; Marquette Park; and the less known Great Turtle Park, which includes a baseball field, skate park, barbecue area, and a play set. Mackinac Island is home to many cultural events, including an annual show of American art from the Masco collection of 19th-century works at the Grand Hotel. There are at least five art galleries on the island. Since 1949, the island's residents have been celebrating the island's native lilacs with an annual 10-day festival, culminating in a horse-drawn parade that has been recognized as a local legacy event by the Library of Congress. The island is a destination for many regionally and nationally proclaimed conferences including the Mackinac Policy Conference. Every summer, Mackinac Island accommodates up to 54 Michigan Boy Scouts and Girl Scouts and their leaders over alternate weeks. These scouts serve the state park as the Mackinac Island Governor's Honor Guard. The program began in 1929, when the State Park Commission invited eight Eagle Scouts, including young Gerald Ford, to serve as honor guards for the Michigan governor. In 1974, the program was expanded to include Girl Scouts. The program is popular, selective, and a long-standing tradition. Scouts raise and lower twenty-six flags on the island, serve as guides, and complete volunteer service projects during their stay. These scouts live in the Scout Barracks behind Fort Mackinac. Mackinac Island is the destination for two sailing races. The island has a sailing club, the Mackinac Island Yacht Club. It serves as the finish line for both the Port Huron to Mackinac Race and the Chicago Yacht Club Race to Mackinac. The races run a week apart, in July. They are both among the longest freshwater sailing races in the world and attract over 500 boats and 3,500 sailors combined. Both races are historical events, having been run every year since the 1920s. The swimming pool at the Grand Hotel is named for Esther Williams, who starred in the 1947 film This Time for Keeps which featured many of its scenes on Mackinac Island. The majority of the 1980 film Somewhere in Time was filmed at Mission Point on Mackinac Island. Several landmarks are visible in the film, including the Grand Hotel and the lighthouse on nearby Round Island. The film's director said he needed to "find a place that looked like it hadn't changed in eighty years." Mackinac Island was featured on two episodes of the mid-2000s TV series Dirty Jobs, with host Mike Rowe as a Mackinac Bridge maintenance worker, and a horse manure and garbage removal/composting collector. In a scene from the 2011 film Super 8 Elle Fanning's character Alice 'Allie' Dainard mentions the island as "Mackinac Island is beautiful this time of the year". John Penn Arndt, merchant, member of the Wisconsin Territorial Legislature. William Beaumont, a surgeon in the U.S. Army who became known as the "Father of Gastric Physiology" following his research on human digestion. Agatha Biddle, fur trader and community leader. Michael Cudahy, meatpacking CEO and land developer. Peter Warren Dease, fur trader and Arctic explorer. Hercules L. Dousman, fur trader and real estate financier, son of Michael Dousman. Michael Dousman, fur trader and sawmill owner. Frank Dufina, Native American golf professional. Thomas W. Ferry, member of the United States House of Representatives from Michigan in 1865–1871, and of the United States Senate from Michigan in 1871–1883, was born on the island. William Montague Ferry, Presbyterian minister and missionary established a mission on the island. William Montague Ferry, Jr., Michigan and Utah politician, was born on the island. 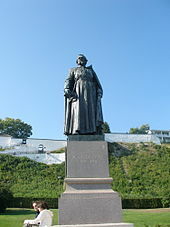 Porter Hanks, Artillery lieutenant in command of Fort Mackinac who surrendered the island in July 1812 to the British. Philip Hart, member of the U.S. Senate from Michigan in 1959–1976. Buried at St. Anne's Catholic Cemetery. Gurdon Saltonstall Hubbard, fur trader and pioneer Chicago CEO. Madeline La Framboise, fur trader and businesswoman, inducted in 1984 into the Michigan Women's Hall of Fame. Jacques Marquette, Jesuit priest and missionary. Henry Rowe Schoolcraft, noted ethnographer and U.S. Indian agent, named many counties and places in Michigan in his official capacity; husband of Jane Johnston Schoolcraft. Jane Johnston Schoolcraft, Native American ethnographer, folklorist and poet; inducted in 2008 into the Michigan Women's Hall of Fame. Alexis St. Martin, French fur trapper, and patient for William Beaumont's research. G. Mennen Williams, governor of Michigan in 1949–1961. In fact, the state owns a residence on the island for the current governor's use; some governors use it extensively, while others have used it only for special occasions. ^ a b c Bailey, John R (1896). Mackinac formerly Michilimackinac. Lansing, Michigan: Darius D. Thorp & Son. ^ State of Michigan (2009). "Mackinac Island". Archived from the original on January 18, 2012. Retrieved August 2, 2010. ^ "Mackinac Island". National Historic Landmark summary listing. National Park Service. Archived from the original on September 5, 2012. Retrieved June 27, 2008. ^ a b c d e "National Historic Landmark Nomination: Mackinac Island" (PDF). United States Department of the Interior. Archived from the original (PDF) on May 10, 2008. Retrieved March 10, 2007. ^ a b c d e Petersen, Eugene T. "High Cliffs". Mackinac.com. Retrieved March 4, 2007. ^ a b c Petersen, Eugene T. "A Historic Treasure Preserved". Mackinac.com. Retrieved March 5, 2007. ^ Nichols, John D.; Nyholm, Earl (1995). A Concise Dictionary of Minnesota Ojibwe. Minneapolis: University of Minnesota Press. ^ Harper, Douglas. "Mackinaw". Online Etymology Dictionary. Retrieved March 8, 2007. ^ Ferjutz, Kelly. "Broadcloth, Brocade and Buckskin—Return to the past on Mackinac Island". FrugalFun.com. Retrieved March 8, 2007. ^ Baraga, Frederic (1878). A Dictionary of the Otchipwe Language. 2. Montreal: Beauchemin & Valois. p. 248. ^ Swanton, John R. (1952). Indian Tribes of North America. Washington DC: US Government Printing Office. pp. 250–256. ^ Blackbird (Mack-e-te-be-nessy), Andrew J. (1887). History of the Ottawa and Chippewa Indians of Michigan: Earliest Possible Known History of Mackinac Island. Ypsilanti, Michigan: Ypsilanti Auxiliary of the Woman's National Indian Association. pp. 19–20. ^ Zacharias, Pat. "The breathtaking Mackinac Bridge". Detroit News. Archived from the original on May 8, 2004. Retrieved July 18, 2007. ^ a b c d e Slevin, Mary McGuire. "History". MackinacIsland.org. Archived from the original on January 23, 2007. Retrieved March 8, 2007. ^ Hamilton, Raphael N., S.J. Father Marquette. Grand Rapids: William B. Eerdmans. p. 43. ^ Boynton, James, S.J. (1996). Fishers of Men: The Jesuit Mission at Mackinac, 1670–1765. Mackinac Island: Ste. Anne's Church. pp. 14–15. ^ a b Jesuit Relations (Report). 1671. p. 12. Archived from the original on March 21, 2016. ^ O'Callaghan, E.B., ed. (1855). Documents relative to the colonial history of the state of New York. 9. Albany, New York: Weed, Parsons, and Co. p. 383. Retrieved October 19, 2013. ^ Thwaites, Reuben Gold (1898). The Story of Mackinac. State Historical Society of Wisconsin. pp. 1–16. ^ Cook, Samuel F. (1895). Mackinaw in History. Lansing, Michigan: Robert Smith and Co.
^ Brinkley, Alan (2003). American History: A Survey (11 ed.). New York: McGraw-Hill Higher Education. pp. 141, 173. ISBN 0-07-242436-2. ^ a b Brennan, James. "Fort Holmes". The Michigan Historical Marker Web Site. Archived from the original on September 27, 2007. Retrieved March 4, 2007. ^ Petersen, Eugene T. "The Victorian Era: A Resort Meca". Mackinac.com. Retrieved March 5, 2007. ^ Slevin, Mary McGuire. "Mackinac Island Fact Sheet" (PDF). Mackinac Island Tourism Bureau. Archived from the original (PDF) on May 29, 2008. Retrieved March 5, 2007. ^ "Population of Michigan Cities and Villages: 2000 and 2010". michigan.gov. Retrieved March 23, 2011. ^ "Eselco Inc · 10-K405 · For 12/31/96 · EX-13". SEC Info. March 31, 1997. Retrieved March 14, 2007. ^ "Welcome to Mackinac Island". Superior Sights. Retrieved March 14, 2007. ^ William L. Blewett. "Understanding Ancient Shorelines in the National Parklands of the Great Lakes" (PDF). Pictured Rocks National Lakeshore. Retrieved May 22, 2010. ^ "Ancient Waterfall Discovered Off Mackinac Island's Shoreline". Mackinac Island Town Crier. Retrieved September 10, 2007. ^ Bailey, Dan Holden (September 1999). "Mackinac Straits". Diver Magazine. Archived from the original on June 20, 2006. Retrieved May 23, 2007. ^ "Coyote Population Begins To Cause Concern on Mackinac Island". St. Ignace News. Archived from the original on May 2, 2009. Retrieved April 12, 2008. ^ a b Slevin, Mary McGuire. "Ecosystem". MackinacIsland.org. Archived from the original on May 15, 2007. Retrieved May 17, 2007. ^ "St. Ignace". Hunts' Guide to Michigan's Upper Peninsula. Midwestern Guides. Retrieved May 22, 2007. ^ "Contact Us". Mackinac Island Town Crier. Retrieved May 22, 2007. ^ "By Air". Mackinac.com. Retrieved March 14, 2007. ^ a b "Mackinac Island FAQs". Mackinac State Historic Parks. Archived from the original on March 20, 2007. Retrieved March 14, 2007. ^ "What happened to a place in Michigan when cars were banned for 115 years?". Bike Delaware. Retrieved February 28, 2013. ^ Dearle, Brian. "Mackinac Island". The New Colonist. Retrieved March 14, 2007. ^ "Mackinac Island State Park: Points of Interest". Mackinac State Historic Parks. Retrieved June 1, 2009. ^ "Accommodations". Mackinac.com. Retrieved March 14, 2007. ^ Slevin, Mary McGuire. "Architecture". Mackinacisland.org. Archived from the original on December 11, 2006. Retrieved March 10, 2007. ^ a b "Michigan: Mackinac County". Nationalregisterofhistoricalplaces.com. Retrieved March 9, 2007. ^ "Fort Mackinac". Hunts' Guide to Michigan's Upper Peninsula. Midwestern Guides. Retrieved May 23, 2007. ^ "A Brief History of Fort Mackinac". Mackinac Island State Park Commission. Archived from the original on June 13, 2007. Retrieved May 23, 2007. ^ a b "Historic Buildings". Mackinac State Historic Parks. Archived from the original on March 6, 2010. Retrieved February 4, 2010. 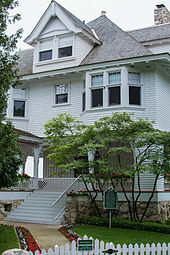 ^ "Biddle House". michmarkers.com. Archived from the original on March 15, 2010. Retrieved February 1, 2010. ^ "Market Street, 1820s fur trade center". Hunts' Guide to Michigan's Upper Peninsula. Midwestern Guides. Retrieved May 23, 2007. ^ "Mission House". MI State Historic Preservation Objects. Archived from the original on September 27, 2007. Retrieved May 23, 2007. ^ "Your Wedding at Mission Church". Mackinac Island State Park Commission. Archived from the original on June 4, 2007. Retrieved May 23, 2007. ^ Petersen, Eugene. "Indian Dormitory". History of Mackinac Island. Mackinac.com. Retrieved May 23, 2007. ^ "Richard and Jane Manoogian Mackinac Art Museum". Mackinac State Historic Parks. Retrieved May 31, 2012. ^ "Geary House Rental". Mackinac Island State Park Commission. Archived from the original on June 13, 2007. Retrieved May 23, 2007. ^ "Ste. Anne Catholic Church on Mackinac Island, Michigan". Roman Catholic Diocese of Marquette. Retrieved June 3, 2017. ^ "Grand Hotel". Roadside America. Retrieved September 10, 2007. ^ Pepper, Terry (December 12, 2003). "Round Island Light". Retrieved May 23, 2007. ^ "Wawashkamo Golf Club". michmarkers.com. Retrieved September 21, 2011. ^ "Governor's Summer Residence Tours". Mackinac Island State Park Commission. Archived from the original on April 17, 2007. Retrieved May 23, 2007. ^ "Traverse Classics: The Secret of Anne's Tablet on Mackinac Island". mynorth.com. Retrieved February 26, 2014. ^ "Mackinac Island State Parks". mackinacparks.com. Retrieved February 10, 2015. ^ Slevin, Mary McGuire. "The Arts". Mackinacisland.org. Archived from the original on December 9, 2006. Retrieved March 10, 2007. ^ "History". Mackinac Island Lilac Festival. Archived from the original on April 20, 2006. Retrieved March 11, 2007. ^ "Tocqueville's Mackinac". Tocqueville's America. University of Virginia. Retrieved July 20, 2007. ^ "Summer on the Lakes, in 1843". University of Illinois Press. Archived from the original on September 5, 2006. Retrieved July 20, 2007. ^ "Preservation of Thoreau Country". The Thoreau Society. 2006. Archived from the original on July 5, 2007. Retrieved July 20, 2007. ^ Havranek, Carrie (May 19, 2005). "Lose Yourself on the Tiny, Exclusive, Still-Affordable Mackinac Island". Frommer's. Retrieved July 20, 2007. ^ "Michigan Salutes Mackinac Island". Documents News from Around the State. Michigan State University. June 1995. Archived from the original on August 13, 2007. Retrieved July 20, 2007. ^ "Mackinac Policy Conference 2017: Five things to watch". Detroit Free Press. Retrieved July 7, 2017. ^ "Mackinac Island Honor Scouts". Girl Scouts – Michigan Trails. Archived from the original on June 24, 2006. Retrieved March 11, 2007. ^ Wilson, Suzanne (May – June 2005). "A 75-Year Tradition of Summer Service". Scouting Magazine. Retrieved March 11, 2007. ^ "Mackinac Island Scout Service Camp" (PDF). upscouting.org. Archived from the original (PDF) on May 29, 2008. Retrieved March 11, 2007. ^ Ely, Sean. "World's Longest Freshwater Sailing Race Bound for Island Harbor". Mackinac Island Town Crier. Retrieved July 23, 2012. ^ "350 boats start Chicago-Mackinac race on Lake Michigan". Detroit Free Press. Retrieved July 23, 2012. ^ "Bayview Yacht Club Retains Jonathan Witz & Associates to Manage Sponsorship, Marketing & Public Relations for Bell's Beer Bayview Mackinac Race" (Press release). Retrieved July 23, 2012. ^ "FAQ Race to Mackinac". Retrieved July 23, 2012. ^ Keith Stokes. "Mackinac Island Michigan photographs". Mightymac.org. Retrieved May 31, 2012. ^ "esther williams pool - America's True Grand Hotel". ^ "Mackinac Island". Find Travel Guide. September 18, 2009. Archived from the original on April 30, 2012. ^ ""Dirty Jobs" airs Mackinac Island episode August 28". Michigan Film Office. Archived from the original on December 20, 2007. Retrieved June 8, 2008. ^ Gould, Karen (June 7, 2007). "Island Work Featured on 'Dirty Jobs': Discovery Channel Show Gets the Dirt on Toughest Island Jobs". Mackinac Island Town Crier. Retrieved June 8, 2008. ^ "Mackinac Island Finally Telling Native Side of History - IndianCountryToday.com". IndianCountryToday.com. Retrieved October 9, 2018. ^ "Prisoners of War - War of 1812 - PBS". ^ "Battle of Mackinac Island, 17 July 1812". Wikimedia Commons has media related to Mackinac Island. Wikisource has the text of the 1911 Encyclopædia Britannica article Mackinac Island.